The story of Noah and the Flood continues with the completion of the ark. After all its living freight was gathered inside, Jehovah shut Noah in. There was a solemn pause of seven days before the threatened destruction was let loose. At last the flood came; the waters were upon the earth. At first, perhaps, the inhabitants of the earth, especailly those who had heard Noah's warnings, were startled by the tremendous storm. Then they must have grown annoyed at the persistent downpour. 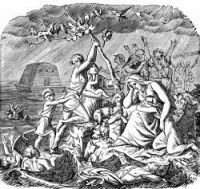 Then the rivers rose and flooded their banks and crept up into the streets of the cities, and people fled from houses to the hills. Then fear came and chaos broke loose. Rafts were buit; men fought for their possession. And in the midst of it all, the waters reached the ark, until it was lifted above the earth and floated majestically away under the protection of God. The waters of the flood increased for a period of 190 days and then God made a wind to pass over the earth, so that the waters ebbed. The ark rested on the seventeenth day of the seventh month on the mountains of Ararat. After this the waters gradually decreased till the first day of the tenth month, when the tops of the mountains were seen. 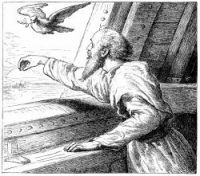 However, Noah and his family did not disembark till they had been in the ark a year and a month and twenty days. These illustrations of Noah and the Flood are from several old Bible books in my collection. Feel free to use drawings of Noah and the Flood in your art work. 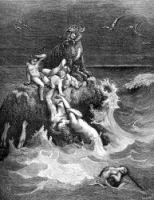 Click on the Noah and the Flood pictures below to see more details about saving a free Noah and the Flood image or about purchasing an image of Noah and the Flood at a higher resolution.